One of the many, many Baroque churches that one can find in the immediate surroundings of the first district of Vienna (the historic Innere Stadt) is the church „Maria de Mercede" in the 9th district of Alsergrund. This church was built between 1722 and 1723 according to plans of a rather significant architect of this time, Anton Ospel. Originally, it served as the official church of the "Spanisches Krankenhaus" or "Spanisch Hospital". This hospital had been founded by Emperor Karl VI for Spanish, Napolitan, Sicilian, Milanese and Dutch members of his court. This was at a time when the Habsburgs ruled over significant chunks of Europe and many of their high-ranking civil servants at the court and their families were from non-German speaking countries. In 1725, a neighbouring piece of land was acquired to extend the hospital. This became even more important after 1754, when the Hospital of the Holy Trinity (Dreifaltigkeitsspital) was closed at the Rennweg and transferred to the Spanisches Krankenhaus. A few years later, the Spanish Hospital became an important centre of medical teaching. In 1769, the Strudelhof court across the street was purchased; it later served as a hospital for patients with infectious diseases. Despite of the expansions and implementation of other medical institutions, the Spanisches Krankenhaus remained an important hospital for international delegates to Vienna. Between 1764 and 1786, the hospital was home to a section for trade agents. In 1784, Emperor Joseph II opened the "Allgemeines Krankenhaus" or "General Hospital" near the Spanish Hospital. The latter institution was merged with the "AKH" and the buildings were turned into an orphanage ("Wiener Findelhaus") and was used by the Redemptorist Order. A local hero was the Redemptorist monk Franz Tendler, who founded the "Katholischen Jünglingsverein" in 1857, which later developed into a significant Catholic youth organisation that is still active today. Franz Tendler died in 1920 and is buried in the Church Maria de Mercede. 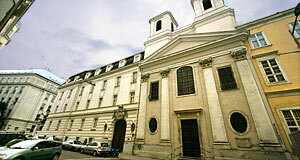 In 1916, the priest seminar of the archdiocese of Vienna was transferred to the former Spanish Hospital - which added a new significance to the Church Maria de Mercede. The building went through both world wars without dramatic damages and in 1969, it was renovated. The church was refurbished under the guidance of an architect called Ottokar Uhl, who avoided to interfere with the historic parts of the Baroque church. Unfortunately, the historic benches of the church were thrown out and replaced by chairs, a new organ was bought and a new altar added, which did harm the over-all impression of the interiors. Noteworthy about the Kirche Maria de Mercede is the stucco work on the ceiling. Nearby attractions: The Spanish Hospital was in the immediate neighbourhood to the General Hospital (today′s Altes AKH) and the Josephinum (sort of an "Imperial College of Surgons"). The General Hospital, the Strudelhofstiege, the Palais Liechtenstein, the WUK and the Volksoper are in walking distance. So are the Sigmund Freud Museum in the Berggasse, the Votivkirche, the Rossauer Kaserne and the Servitenkirche, as well as the Lichtentaler Pfarrkirche.